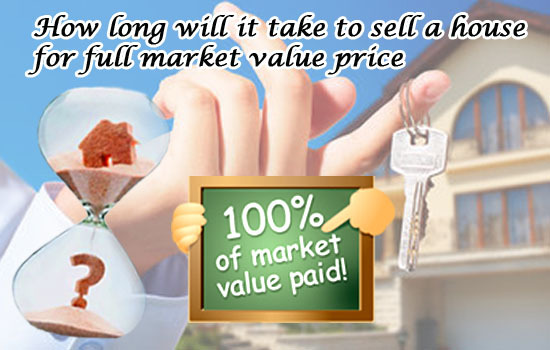 Quoting a period to sell a house at its best price is quite sensitive topic. An estimated period to sell a house at its full market price could range between 30 days to 90 days. This period could be highly depending on the way you want to sell your house. Steps to determine the wait period to sell your house for full market value price. take some time out and evaluate your house. This evaluation period could help you give a reality check about the status of your house. Houses in bad condition need more time to repair and fixation on the other hand a well maintained house needs lesser time to be fixed. After introspecting the condition of the house. The seller will have a clearer idea as to how long will it take to bring the house in a saleable condition. One must action out the repair and rehabilitation of the house immediately in order to save on time. The sooner the better. after preparing your house for the sale you need to ensure that awareness is created about the sale of the property. Marketing the property is similar to marketing a product. You can either do it on the internet by posting ads on property websites or go the old school way by putting board outside your property. One most carefully choose their marketing tool as it determines to a large extent the waiting period to sell your home. Seeing is believing. Hire a professional photographer and let him capture your house beautifully through his lenses. Attach these images to your advertisement. This will increase the traction to your advertisement and help you sell your house faster at full market price. you can now sell home as it is without having to spend a lot of time and money in fixing it. The longer you hold on to the property the longer you will be obligated to high commissions and mortgages. Action it out fast. Many property buying companies today are ready to buy properties as it is. Today you are equipped to sell your house within a week and utmost 3 months. Many companies guarantee you a time period of 30 days within which your house is considered to be sold. It is up to your discretion if you want to repair your house and sell it or sell as it is. We would recommend you to do a full back ground check about both these methods and do the needful. With this we would like to conclude that selling your house at full market price is definitely doable within a tentative period of 30 to 60days approximately. This time period is subjective to change based on the selling options chosen by the property seller. Quoting a period to sell a house best price is quite sensitive topic. An estimated period to sell a house full market price could range 30 days to 90 days.